Let’s talk about the NIH sponsored study on review outcomes for R01 grant applications from different racial and ethnic groups and the accompanying commentary that were published in Science this week. The paper, together with a previous NIH-commissioned study describes a biomedical research pipeline with few students and postdocs from underrepresented groups, coupled with disparities in review outcomes when they do apply for an NIH research grant. NIH finds these results troubling. As someone who has been involved in designing and implementing government peer review programs for over 25 years and one who believes strongly in peer review as the best way to identify good science, I find these results troubling as well. At this time we don’t understand fully the basis of the disparate review outcomes. What I do know, however, is that the NIH reviewers are outstanding individuals, who tirelessly devote their expertise, time and effort to making the biomedical research enterprise and NIH program the model for the world. We greatly value our reviewers and their contributions to our success at supporting high quality science that has huge impact on people’s everyday lives. It is essential to include diverse groups in our efforts to improve the health of the nation. Diversity improves the ability to conduct research in all fields, but attracting the brightest minds who represent a broad range of interests is especially important for biomedical research. NIH has a long history of efforts towards achieving this goal, aiming to include, particularly in our training programs, underrepresented racial and ethnic groups, women, individuals with disabilities, and individuals from disadvantaged backgrounds. However, our efforts to establish a robust pipeline for a diverse workforce all the way through to principal investigators have been less than successful. Fewer than 2 percent of our PIs are Black, lower than the percentage of Black faculty at medical schools and much lower than the general population. The same holds true for Hispanics. It is imperative that NIH rethinks its approach. As Drs. Tabak and Collins indicated in their commentary , we have launched new diversity-focused research programs, assembled new advisory groups, and are planning experiments to specifically identify issues that might be contributing to differential review outcomes. The NIH can’t do this alone, however. We need to work together with the biomedical research and academic communities, sharing our successes and learning from our failures. My hope is that there will be renewed efforts across these communities to diversify our workforce. Can we improve the way we support new faculty members as they apply for NIH funding? Can we become aware of unconscious attitudes around race and gender that may influence our judgment? How can we make careers in research more attractive to those from underrepresented groups? At what point in their lives are individuals making decisions about science as a career and are there interventions that we can do at these critical points to steer more underrepresented groups towards exciting research careers? Because this issue is so central to the operation of NIH and the success of our programs, NIH is committed to moving in new directions and sharing findings with the community as they emerge. I invite you to work with us and to share your suggestions as we as a community work through these important issues. This entry was posted in blog, Rock Talk and tagged Biomedical Workforce, Funding data by Sally Rockey. Bookmark the permalink. May I suggest to include individuals in the eligibility criteria for NIH grants. Also, it would be nice if racial and ethnic conflict of interests are clearly stated in NIH grants and publications. Thank you. Well isn’t that interesting? I suppose I should feel even more fortunate than I already do for the grant support that I have enjoyed so far. As the Tabak/Collins commentary would seem to imply, the NIH should very rightfully take this as a serious wake up call. It took a long time for the NIH to clue in to the fact that it was a bad idea to remove Assistant Professors from review panels, a half-decade initiative for which the reversal is being touted as a great new idea. In the intervening years, the NIH decided they needed to intervene with Programmatic adjustments to the priority scores of newer/younger investigators to account for their maltreatment by study sections. I will be watching with great interest to see how the NIH backs up all of these nice words about how seriously they take this new revelation of imbalanced outcome for African-American applicant PIs. If we do not see immediate Programmatic adjustments (i.e., grant pickups out of order) to counter this bias, it will be hard to conclude that the NIH sees this as anything other than a PR problem. I find it interesting that the Ginther article says nothing whatsoever about reviewer bias as the culprit of the disparity between blacks and whites in R01 awards. Ginther rather states that the “models do not fully explain the funding gap” and that the “greatest differences we observed were in the effect of previous training.” Yet the media and Francis Collins have jumped on the peer review process as the culprit and claimed that there is some “insidious bias” in review that accounts for the disparity. I am as puzzled as anybody but my hypothesis is that this is the result of some institutional and pedigree-based bias during peer-review. For all theoretical emphasis on diversity, equal opportunity, etc., the vast majority of young faculties at top institutions are white Anglo-Saxon kids. The same is true for postdocs in “glamorous” labs. If you are born in a priviliged environment, it´s likely that you´ll go to a good school, then to a good college, and from there you´ll be most likely to access a good graduate school and later a top postdoctoral position. At places like Harvard or the MIT, it´s clear that pedigree is the main consideration in faculty searches. And I have clear that both pedigree and environment count at the time of peer-review. I suspect that “this fellow can only be good because he/she comes from this famous lab and is at Harvard” is a common thought for some reviewers. I whish I was wrong, but this worrisome issue requires a very careful analysis and consideration of all details. Was there any analysis of the participation of underrepresented minority scientists as Project Directors, Co-Directors or even Component/Core PIs for Centers and Program Projects? How about for U-mechanisms and contracts? Application rates and success rates would be really interesting. The NIH extramural support is not only R01s…. The study was limited to R01s, and we do not know, at this point, how including other mechanisms would affect review outcomes. Responding to the comment by the Rock Talk Blog Team, “The study was limited to R01s, and we do not know, at this point, how including other mechanisms would affect review outcomes.”….It should be noted, thankfully, that there are significant diversity-promoting programs in effect through the ‘K’ award series. I’m particularly highlighting the K01 awards……With these ‘diversity-promoting’ programs relatively-recently enacted by the NIH, it will take significant time to assess if they have an impact on diversity levels at the R01-level in the future. My intuition is that they will have a significant impact on increasing diversity levels over time. What I foresee the largest issue to deal with, with regard to political correctness, will be what actual ‘level’ of diversity the NIH is striving for. The data presented on Hispanics showing no gap may be biased. The data should be disaggregated to show how native born and educated Hispanics fare versus foreign born and trained Hispanics. Having served on several study sections over the years I am aware of the bias publicly stated on numerous occasions in support of the pedigreed “good-old-boys.” It was not uncommon on any of these study sections to hear a reviewer state that this young applicant deserved a break because he (generally a he) was trained in this famous person’s lab at Harvard (or any one of the top 20 institutions) and then did a postdoc with this great person’s lab at UCSF (or any one of the other top 20 institutions). No such break was ever proposed for someone who got their undergraduate or graduate degree as a small state college, an HBCU, or a Hispanic Serving University. Bias exists. All responses are as expected, at least for me and bring me back to debates about whether PI names should be masked or not for review process some time ago. It is also a kind of human nature that people would help people who they know, right? Rumor says that unless you know reviewers in the study section there would be no chance to be scored. I would think that it would be the best to remove all personal information from review process. “Rumor says that unless you know reviewers in the study section there would be no chance to be scored”. That may be a rumor, but as a long time reviewer, and applicant, I believe it’s also a myth. The perception/belief that study sections are merely “good old boy” networks is, in my experience-based opinion, false. And consider this point: Any bias based on knowledge of the applicant as a person can work both ways. While scientists can certainly make “network” friends during their careers, they can and do also make enemies (rivals, if you prefer). When I am submitting an R01 nowadays, I look at the study section roster, not to seek out the names of “buddies” but to look for people I suspect might give me (not my science) a hard time. That may be paranoia, or perhaps not, but the point is that “networking” and “career experience” can be an asset or a detriment to an applicant. I also think it’s irrelevant to the true underlying cause of the racial disparity findings, as outlined in my earlier post. If NIH wants its funded applicants to reflect the diversity of of the US population, NIH should stop funding based on the (vast) experience of the applicants as independent investigators. That means NIH only follows the money–just like a who-you-know organization. If you are a new applicant, your best chance is to ask someone well known in your field to be a co-investigator. Most minority applicants are new investigators or investigators who have been trying to get funded for a long time but unsuccessfully. If NIH only follows the money, it is at best hypocritical to say that they want to be more inclusive. The review process is just not a fair process. Another way to reduce biases is to consider the closest scores of the 3 reviewers. Recently I resubmitted a proposal with a score of 2 by 2 reviewers and 6 by the 3rd reviewer resulting in a final score of 37. In this case, it was obvious that the 3rd reviewer wanted to kill the proposal. NIH should have excluded the score of the 3rd reviewer. So I am still looking for funding for the 1rst time after trying for the last 2 years. If you are persistent enough, MAYBE one day in 3 to 5 years the NIH review process will fail and let you in (by mistake). Is a very interesting dataset. The challenge is now to dissect the causes. As for any problem setting forth a hypothesis (there is a bias at study section? underrepresented minorities send their grants to K-series instead of R01? the smartest minds in different ethnic groups may not distribute equally toward an academic vs. other career tracks? etc.) is the way to go and then carry out experiments to validate/invalidate it. One approach would be to use the same grant in different study sections but change the applicant name so ethnicity might be revealed. This kind of study will have to also address why we have over-representation of certain ethnic groups in funding. Our lack of diversity at the NIH funding level has its roots in K-12 and undergraduate education. The NIH could be more proactive about supporting minority programs such as NC Project SEED at the high school level and requiring inclusion of minority fellowships for students at the undergraduate and graduate level in our large Program Project awards. We clearly see the problem but have not proactively identified points of intervention to solve the problem. I think the causative factor for poor diversity in the R01 program isn’t reviewer bias based on ethnicity, race, gender, etc., but on bias in the educational pipeline and on mentors tending to select trainees that have similar personal characteristics to themselves. And @ Anonymous: A cometent review that is also ‘blind to personal information’ is not a realistic solution to combating reviewer bias. Reviewers are selected for their expertise in a particular field, which by definition means they are quite familiar with who is who and who does what in that field. Even when a ‘new investigator’ submits a grant, the quality of previous publications are a factor and the coauthors on those pubs are a clue to the pedigree. The review process can still be made sufficiently blind. The review panels could be given ONLY the scientific idea and approach to evaluate, and score only these factors. Let’s call it a scientific merit review. Then, the POs should perform the second stage of review by evaluating the PI’s credentials and environment (the “chance of success” review). I second that. The reviewers would critique the science of the application and not the investigators. In that case, the review process would be based on scientific merit! If the biases were a reflection of a “good old boys” network, wouldn’t female applicants be disadvantaged as well. Although the review panels themselves contain a higher percentage of females than of minorities. Years ago I read a study that said that most scientists come from middle class families. Children of wealthy families tend to gravitate to high income careers in business and finance. Similarly, children of poor families will pass over opportunities for scientific careers to choose more lucrative professions such as medicine and law. I think one has to be very careful in interpreting the published study regarding diversity. What I have noticed in the the last couple of decades is a continued decline in the quality of American graduate student applications due largely to the vagaries of scientific funding and career opportunities. Of the American students who do earn a Ph.D, in many fields the best are turning away from a postdoctoral fellowship and instead turning to jobs in business consulting and finance. In contrast, some of our best students who remain in science and junior faculty were born overseas, where we continue to be competitive in attracting highly intelligent, motivated individuals into our educational pipeline. This is not an ethnic issue, but rather one of cultural values and opportunities. In our training grant and other programs, we have already implemented powerful incentives for diversity. This has led to intense competition for minority students. As a result, many minority students are admitted to graduate programs for which they are not as well prepared as non-minority students. They not infrequently struggle in such programs. A significant fraction of these students perform less well than the average. I am therefore wondering in terms of the attempts to normalize R01 success rates in terms of educational backgrounds. Were such comparisons biased by the skewed graduate admissions policies for minority students. How does the R01 success rates compare if one normalizes by citations of publications produced as an independent investigator for example? Personally, I would welcome a cure for cancer from anybody- black, white, yellow, or polka-dotted. I believe funding should continue to be directed to what are perceived to be the best grants. Yes, we should investigate and make sure bias is not part of the reviewing process. But we should be very careful not to jump to conclusions of bias, and continue to focus on funding the best science, no matter who is producing that science. The pie chart is inadequately described. What group is green (the fourth largest sector)? Remove all identifying information, including institution, from the reviewer and let the science speak for itself. As a faculty member at a doctoral granting university which also happens to be an HBCU (Historically Black Colleges and Universities), I find it very telling that the comparison made by NIH only look at % of Medical School faculty when it comes to RO1 funding. I would like to point out, that much excellent research in this nation comes from faculty at universities that train undergraduate and graduate students OUTSIDE of medical school environments. Based on my own experience, most minority faculty is employed at such institutions, NOT at medical schools; the reasons for that may be grounds of a separate discussion on disparities. 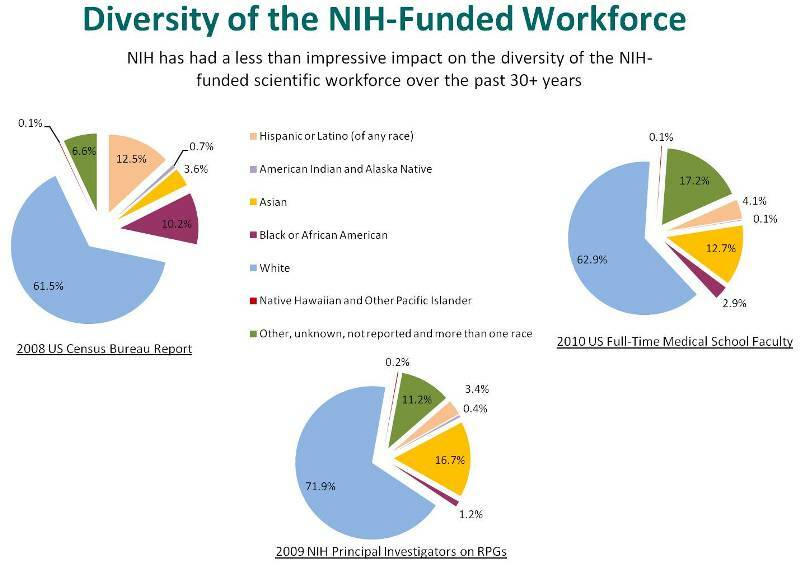 I wonder, if NIH had looked at published minority faculty, via a vis NIH RO1 funding, how much worse the numbers would look? The bias on NIH review panels towards investigators based at medical schools and “big name” institutions is insidious and in many cases subconscious. I am well familiar with it, because I have had the opportunity to participate in a number of such review panels. This is detrimental for the future of all biomedical science since the majority of our students (and I am talking here about undergraduates in particular) receives their initial research training in the laboratories of NIH underfunded and under-appreciated faculty at colleges, comprehensive universities and yes, doctoral granting universities, across the US. However, “medical school bias” is particularly detrimental when it comes to minority training institutions such as HBCUs. Why? Because the majority of students who go on to enter PhD programs and eventually receive graduate degrees, receive their undergraduate degrees from HBCUs and other minority/majority institutions. Thus, the disadvantages that many of our minority scientists carry with them from their K-12 education in stressed public school systems, follows them into college, where there faculty struggles against NIH reviewer biases. Perhaps such roots to the funding bias for minority investigators deserve some exploration now. What about the Asian bias? It is the same ratio as Hispanics but in an opposite direction. Is there any reasonable explanation for that? Are all Asian PIs coming form the “great” labs? Or does this statistics reflect the review bias? I have never witnessed racial or gender bias in the grant review process, and have never heard any colleagues say they have, and I have been part of the grant review system for 25 years. I think the idea that grant reviewers have the time or inclination to study applicants’ CVs for indications of racial origin (names, schools etc) is really absurd! Also, given how socially liberal most scientists are, any bias would surely work in favor of URM applicants, if they were identifiable as such. In other words, I think that reviewers, collectively, are being accused of a racial bias that there’s no direct evidence exists. To me, the most significant findings in the study were, first, that the URM applicants fare badly at the triage stage; second, that there’s a correlation with a shortfall in senior author papers (on that point, there should be a secondary analysis done concerning the quality of the journals, and the impact of the papers, if possible). It pains me to say this, but my own hypothesis to explain the data is that we are witnessing an aftermath of the Affirmative Action policies that mean URM applicants receive NIH studentships, fellowships, and training grants; and then faculty appointments, at a lower level of professional ability than other racial sub-groups. Everyone in academia understands the pressure institutions are under to appoint URM faculty members (and for NIH to promote their careers). These are good and important social policies that need preserving. But at some point, the system unwinds and the URM faculty members have to compete on a level playing field, i.e., an unbiased study section unaware of racial origin. At that point, a poor grant is a poor grant, and it is triaged. Of course a substantial proportion of URM faculty thrive, but statistically, many will not. To me, this is an “obvious” hypothesis to discuss and investigate, but the newspapers and government officials have either not seen it or are not willing to acknowledge its existence. And yet if we do not acknowledge a problem, how can we ever solve it? I think this letter raises an important issue. Frankly I think it is very, very difficult to determine equivalency of training, which the authors attempted to control for by determining productivity via several metrics including number of citations, number of first or last or single authored papers and impact factor == Tables S4 and S5. There were some potentially interesting correlations found by the authors, although depending on the statistical model used, they don’t fully explain the overall differences in probability of successful NIH funding. Major differences (p1018) included percentage of last authored papers, and number of citations to previous work. These indicate to me that training and mentorship to promote subsequent productivity are areas that should be targeted for improvement. These findings are not surprising at all. They correspond to the research on unintentional bias in hiring that shows CVs with female or ethnic sounding names are routinely rated less favorably than those with names perceived to be white males. This fact suggests that Anonymous’ suggestion above would be the way to make change. I am puzzled by all the puzzlement. Populations of self-identifying American blacks and Hispanics show different statistical profiles on all known tests of cognitive ability. The means of the relevant distributions are below the means for self-identifying whites and East Asians, with means for Hispanic populations intermediate between those for white and black populations. There is a vast literature on this, easily located on the internet. There are also innumerable news stories about litigation related to the differences, e.g. in test scores for city firefighter positions. The black-Hispanic-white “achievement gaps” in test scores of public-school students have been an obsession with educationists for decades: there is a huge sub-literature just on this topic. Since we are dealing here with the high end of the cognitive distributions — the right-hand “tails” — well-known statistical arithmetic kicks in. For any given high range of cognitive ability, there are far fewer black and Hispanic researchers than white and East Asian researchers. The result follows. Why the puzzlement? If this is unacceptable to NIH, the solution is straightforward. All applicants should be assigned to some appropriate racial category by independent assessors. Then grants can be made on a quota basis. As a parent of a bi-racial kid, I am very much interested in future racial policies. This is the direct effect of affirmative action. Less than qualified beneficiaries make it through the cracks, and then they submit less than competitive applications. The proof? Asians (who are not an “underrepresented” minority, and who do not benefit from affirmative action) are not affected. You are wrong, of course. In fact I think that those fellows from underrepresented minority groups who overcome the huge barriers that they encounter to reach a faculty position at a college or medical school are very special people and have resources and motivations that are, I suspect, beyond your comprehension. The problem, as I said above, is that affirmative action only applies in theory in big labs and in big institutions at the faculty level. The gap of opportunity to reach that level is too big. And, as I and other said above, there is some bias that favors certain institutions and certain pedigrees in peer-review. I work in what I think is an elite institution and we do not have a single African-American among our faculties. The same is true for most institutions where I have been trained. When I participated in search committees, nobody cared about affirmative action. At least in a positive manner. Sally, I strongly agree with you that “NIH reviewers are outstanding individuals, who tirelessly devote their expertise, time and effort to making the biomedical research enterprise and NIH program the model for the world. We greatly value our reviewers and their contributions to our success at supporting high quality science that has huge impact on people’s everyday lives”. From my own experience in my grant submissions, I always felt “helped” by those reviews and agreed that their suggestions improved my science. It is clear that as early as preschool, budding innovators of races/ethnicities/sexes underrepresented in the biomedical sciences traverse educational and mentoring pathways distinct from those individuals who currently make up the majority of the NIH workforce – and, in particular, those in leadership positions. Numerous programs and studies funded by the Science Education Partnership Award (SEPA) agency within the NIH National Center for Research Resources have highlighted best practices in promoting diversity in the biomedical sector (and enrolled into clinical trials). Our published findings (Gervassi, A. et al., 2010) confirm that interventions that are mindful of developing a program with intentionality, build positive and individualized connections with diverse youth, utilize highly skilled staff, feature lasting and mutually supportive relationships with secondary schools and participant families, engage community members and that incorporate a variety of fun and engaging program activities can change this status quo. In our case, 18% of the secondary students that have been through our program have gone on to work as interns or paid technicians who have contributed to the scientific mission of our organization (e.g., Oliver et al., 2008). Precollege programs, by themselves, will not make careers in research more attractive to those from underrepresented groups. These teens must be invited and nurtured along their development pathway by today’s research leaders who can see that the untapped breadth of culture, imagination, compassion and innovation is vital to tackling our most recalcitrant behavioral and health challenges. We cannot be mere spectators of the vital work of others in cultivating these future leaders. Join students, teachers, SEPA PIs and other noteworthy enrichment programs in delivering the promise. I find CDo’s comment very interesting :”I am as puzzled as anybody but my hypothesis is that this is the result of some institutional and pedigree-based bias during peer-review.” I think this plays into it, and data to ask this question could be mined. The data also exist to determine if ethnic-sounding names determine bias, because not all African Americans have non-white-sounding names. My experience in working with African Americans as a grant coach points toward a lack of mentoring. This plays into many of the points above, even some I don’t particularly agree with. If someone is in fact hired or accepted into a program for affirmative action reasons, as Puck proposes, but has not been mentored to the same level before arriving, and isn’t mentored going forward, then of course they’re not going to achieve at the same rate. A large part of what I do in such cases is point out where the standard is, whether it is basis of evidence, clarity of hypothesis, all things that should have come from their scientific mentors. Maria Elena de Bellard points out a reticence to ask for help–to seek mentoring–in part because of the pressure on a minority to never seem weak in any way. I see this in action. I’ve also seen the flip side of this, where a potential mentor hesitated to offer the help they would offer a white or Asian without thinking, and the hesitation was based in the misguided idea that they could offend the African American person by implying that they thought they needed help. In other words, the potential mentor was so afraid of appearing racist, the result was disparate treatment based on race. Anonymous consultant makes some important points here that need to be considered in all colleges. In my own, there’s next to no “grant coaching” for any faculty members (it’s a sink or swim environment), but wherever there are such programs, it seems important that they be applied effectively, and with awareness of what the individual recipients need and would optimally benefit from. Nobody wants to see ANY newly appointed faculty members fail without being given every chance to succeed in what is a pretty competitive career structure. The question isn’t grant coaching. That is simply the context in which I see the result of different treatment at every level–insufficient mentoring as graduate students and post-docs, and insufficient mentoring as new faculty members. I get to work fairly closely with my clients, and I do not see differences in overall levels of intelligence. I can sometimes identify similar mentoring deficits with my other clients (white, Asian, Hispanic), but it’s nearly consistent with the African Americans I’ve had the pleasure to work with. Racial bias, conscious or unconscious, is a factor even before the application comes before the reviewers. American Indians and Alaska Natives should be especially upset by this report. Distant from NIH, major NIH funded research universities and often ignored by the dominant culture, AI/AN students, faculty and PIs from small colleges and universities are significantly less than one percent of the diversity workforce. In regards to PhDs, while other groups have made significant progress over the last 20-30 years, American Indians and Alaska Natives show a depressingly flat baseline. NIH and NINDS have developed programs that have shown some success at graduating science PhDs, developing post doctoral fellows and mentoring American Indian and Alaska Native faculty at small research universities. The wheel does not have to be reinvented. The successful examples from Specialized Neuroscience Research Programs and INBRE programs should be supported as examples of best practices. These programs have made progress, albeit slow, but considering where these small universities began, the NIH investment has shown a good return. Invest in mentorship of American Indian and Alaska Native scientists so that they can successfully compete for faculty positions and competitive research grants. It must be remembered that the location and supportive nature of the mentoring institution is very important, as is the acceptance of indigenous culture and world view. A diversified workforce brings different perspectives together to solve problems that will benefit all. Claims that findings of this study are the result of affirmative action and that findings reflect the “cognitive” limitations are truly disgusting. NIH should remove them from this blog. They are offensive. So, you don’t believe that there can be a rational discussion of important topics, but would rather prefer to censor debate? Is that what we are to conclude from your posting? Some would consider that form of censorship to be offensive too… Of course I believe your posting should not be removed as you have the right to say something I don’t agree with. Since Mr. Derbyshire is so up on the statistics, why has he failed to note that when range is restricted on one variable (say the IQ of biomedical researchers at the grant-writing level), the relative contribution tends to dissipate. If he had any knowledge of the way science works he would have the direct experiences that many of us have. Success in science is hardly a direct correlate of mental horsepower as we think of it contributing to the (highly debatable, an honest broker would note) racial IQ disparities. Again, this is because of range restriction. You don’t get very far in these careers with a population mean IQ. College grads alone are at 1SD. Postgrads up from there no doubt although fewer data exist, afaik. I would like to see some analysis of what several earlier posters have referred to: the point about whether URM applicants can be identified via distinctive names, and whether that creates bias against them. My own belief is that most reviewers would not bother trying to guess whether an applicant was a URM member or not, and that even if they did, any bias would work in the applicant’s favor, given the general social attitudes of academics who sit on study sections. But let’s see what the numbers show? However, I do not see how there can be a truly accurate breakdown of whether names predict racial group membership (except for Asians); the division would probably to be pretty crude, and that would likely blur any statistical analysis. Is “Henry Gates” obviously, by name alone, identifiable as an URM member? Is “Cornel West”? My own closest African American academic friend has a name that is in no way predictive of race. In other words, I remain to be convinced that the name issue is a significant influence on the survey’s outcome. Well, as you noted, Asians can be accurately identified as non-white. Yet it does not deny them the opportunities. This makes the further discussion of the hypothetical influence of “funny names” (associated with race, and enabling racism) completely moot. In the study sections I am most familiar with, Puck, grants are very frequently being reviewed by people who know the applicants professionally. Perhaps my subfield of science is very small but I would venture that this is the case for many situations in which “appropriate expertise” means the reviewer and PI overlap in a very narrowly defined area. It is also the case that some underrepresented folks are very visually salient and others are not when it comes to a casual glance around a room at your average academic meeting. Point being that the black investigators are potentially better known to the field than the average overrepresented white investigator simply because of attentional popout factors. The question is not what proportion of reviewers guess the PI’s racial or ethnic background but what proportion of reviewers already know who the PI is. Fair and reasonable points. My own study section experiences, in quite a large field, often involved investigators I did not know personally. But of course there’s considerable diversity in how study sections operate (and their “culture” for want of a better word) across the entire NIH system. I am not surprised at the results of this study; I think it would be even worse if the study also looked at the percentage of total grant money that goes to the so called “good-old-boys”. I believe that women would score as bad as minorities. NIH program contact was not talking highly about affirmative action. The Phase 1 initial investigation small business grant R 43 is exclusively for “academic scientists “, if they decide to start a small business; it is “not for outsiders”. I was told by more than one NIH representative that the number of publications is the most important factor in determining the investigator’s qualifications for the small business grant (and no one could compete with academic scientist in the number of publications). It is also interesting that drug development experience is not considered to be relevant for a drug development program and all reviewers are academic scientists that have limited knowledge of drug development (based on their reviews). However, drug development has complicated regulations and not all scientific research could be developed into a successful drugs candidate. For any successful program, knowledge of drug development process is critical. Only big pharmaceutical companies have the resources to fix mistakes during drug development as an average cost to bring a new drug into the market is approximately $800 millions. A few things NIH can do to remove bias from the process. •	PI names should be masked for the review process. •	Remove letters of recommendation, which I was told play a significant role in how grants are awarded.Reviews should only look at the merit of the project. The current process depends on who you know and. •	NIH needs to increase the number of reviewers that have expertise in drug development if the grant is for new drug development programs, as it would bring regulatory drug development perspective to the review process. •	Sections of the grant that deal with vertebra animal care and protection of human subjects should be substituted with IRB approval, AAAALAC accreditation and USDA and OLAW compliance letters, as these organizations are responsible for insuring that research is done ethically. Such determination cannot be done from one page summary; however, this section is one more area where “outsiders” could get poor score. The section of the grant which talked about research should be increased instead. I would be glad to provide supporting documents to anybody who is interested. Unfortunately, it is unlikely to be the case. I think you have been given some very bad advice regarding SBIR grants and what makes them competitive. My experience over the past 6 years has been the one thing that most affects the score is the quality of the research plan. The ones that fail tend to be vague, with little detail on what they plan to do. Much space is spent on justification (“selling”) where reviewers want specifics on the plan, methodology and recognition of potential barriers and plans to overcome them. I’ve wondered if these applications are written this way because the PIs fear that they are giving away their business plan. I can understand that, but you have to tell the reviewer what you will do and how you will do it if you want to convince them that you could be successful. It’s true that Phase I is for feasibility, but I have not seen any bias toward faculty trying to start a business. In fact, I have seen very few applications from faculty. Some of these fail because they don’t demonstrate that the investigators have experience in the area they plan to work in. You can’t propose a gap analysis and expect that it will be a competitive proposal. Your response is quite interesting. I would like to see the supporting evidence you have mentioned it would actually be very helpful in a project concerning this very issue. I will use the contact website provided to address this request further. Thank you in advance for your input and consideration.